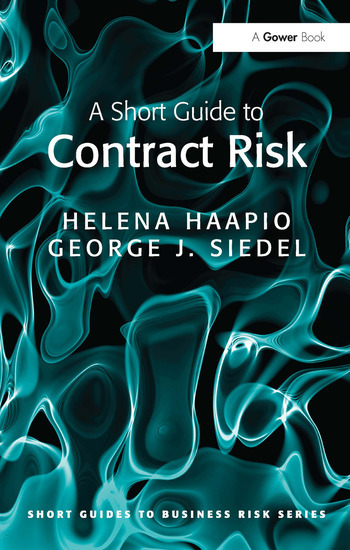 Contents: Foreword; Introduction; Contracts and risks - the big picture; Sources of contract risk; Risks in negotiating a business contract; Risky terms and issues in contracts; Contract risk recognition and response: processes and tools; Conclusion; Index. Helena Haapio works as International Contract Counsel for Lexpert Ltd. Completing legal studies in Finland, and at Cambridge University, Haapio served for several years as in-house Counsel in Europe and the USA. She has designed and conducted training workshops around the world, acts as arbitrator in cross-border contract disputes and undertakes multi-disciplinary research on ways to enhance contract usability and communication. George J. Siedel is Williamson Family Professor of Business Administration and Thurnau Professor of Business Law at the University of Michigan. He has served as a Visiting Professor at Stanford, Harvard and the University of Sydney. After legal studies at the University of Michigan and Cambridge University, Siedel worked in a professional corporation as a corporate attorney. Haapio and Siedel are the award-winning authors of Proactive Law for Managers. They are active members of professional bodies including the International Association for Contract & Commercial Management.